To have your mammies grammed or not, that seems to be the new question. 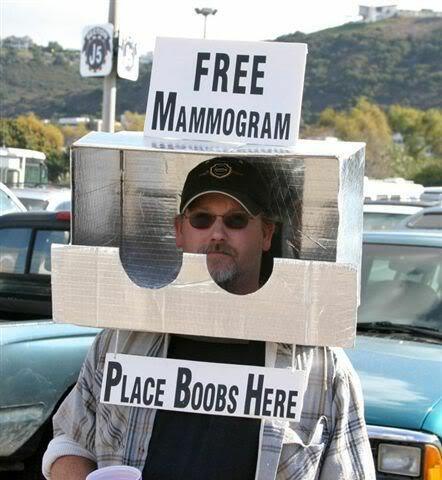 Ok, maybe distasteful but I think this is the most clever Halloween costume or part-time job (which ever way you want to look at it) ever. And is he drinking a beer to boot? You’ve got to love his creativity. I don’t know about you but this new set of recommendations from the government advising women to now wait until age 50 to begin screening for breast cancer has me thoroughly confused and a bit frustrated. It has taken years and years and millions and millions of dollars to pound into all of our heads that at age 40 you go and get your boobies painfully squashed between some device in order to possibly detect breast abnormalities which could be cancerous. Also, self-examination. How many times have you had that fun conversation with your ob/gyn where he/she asks you if you do monthly self-exams in the shower, demonstrated how to best do it and given you a shower hanger card? Early combined with self-detection has been the catch phrase of the past 15 years at least. And now, after all this time and all of us dutifully following the government guidelines (imposed by congress mind you), they are retracting and telling us to wait another 10 years? They may very well have a solid, science and fact- based argument as to why we should wait. In fact, it seems as if they do. I’ve heard that women from 40-49 have denser breasts which leads to more false positives, more unnecessary biopsies and more stress. That the results are not as reliable or accurate in younger women. That if you don’t have a family history of the disease, you’re better off waiting until age 50. But why should we believe you this time Uncle Sam?!! Breast cancer is still the 2nd leading cause of death in this country. The American Cancer Society, a very well-respected organization, disagrees with this decree and is fearful of the damage it may cause leading women to just throw up their hands and give up screening all together. And, hey, what about the fact that now our government has even taken away the only legitimate reason women had to feel themselves up once a month! Come on. Where does it end? I guess it comes down to your choice (to continue “self-examining if that’s what you want to call it” and/or get a mammogram), at least for now while the insurance companies are still covering it for women 40-49. I just had my annual exam last week and my ob/gyn advised me to schedule my first mammogram since I will be 40 in June. I don’t know what to do now. Honestly, most of the people I know who have had cancer detected the lump themselves or had some sort of symptoms (if it was a different type of cancer). I don’t know personally anyone whose cancer was found through a mammogram. But that certainly doesn’t mean they don’t find cancer that way. I’m curious if these new guidelines will change your mind about when you get a mammogram. I’m curious whether these new guidelines are truly scientifically founded and in all of our best interests or motivated by money or a way to save money, ration health care expenses. It’s kind of hard not to go there with all the controversy and debate swirling around health care. What do you think? Since we’re on cancer…my next post I’ll be talking the best foods to eat to prevent cancer or the “Anti-Cancer Diet” and some yummy recipes featuring those foods. In honor of my funny friend Lou recently diagnosed, who is on the road to kicking some serious cancer booty! Save room for dessert…Pumpkin Cheesecake, Pumpkin Rum Pie and Apple Pear Cranberry Pie to be specific!